The ability to machine damaged flanges on-site can cut maintenance and shutdown costs considerably. Set up in minutes rather than hours, the smooth operation of each machine, combined with accuracy, results in an exceptional flange face finish. 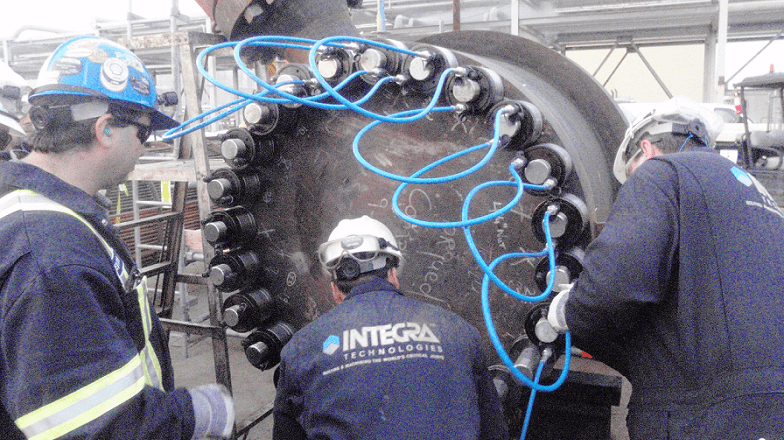 From 0” to 144” ID or OD mount, INTEGRA has the flange facing equipment to fit applications from a standard raised face to RTJ type flanges, manway covers and heat exchangers. INTEGRA’s line of D.L. Ricci Corp. narrow body clamshells is lightweight and highly durable. Easy to set up and operate, the NB range of clamshells is capable of severing, beveling, ID boring, facing, and OD turning. Special purpose machines are available to suit a wide range of pipe diameters, wall thicknesses and restricted access areas. The ability to simultaneously cut and weld prep is advantageous on many applications.